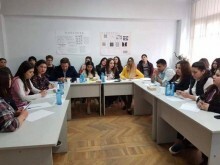 Inter-university debate competition was heldThe inter-university debate competition, organized by "Non-State University Student Center" NGO and RPA Youth Organization, was finished in 25 April. Student teams from 8 non-state universities participated in the program. The program aimed at developing skills of art debate among students. The young people debated on various topics “How to change the technological progress in our life?”, “What is the effect of soap-operas?” etc. The team of the University named after Mesrop Mashtots was the winner. The second place was taken by the team of Urartu University and the third place – University of International Economic Relations.